The keyboard is the piece of computer hardware used to input text, characters, and other commands into a computer or similar device. Even though the keyboard is an external peripheral device in a desktop system (it sits outside the main computer housing), or is "virtual" in a tablet PC, it is an essential part of the complete computer system. Microsoft and Logitech are the probably the most popular physical keyboard manufacturers, but many other hardware makers also produce them. Modern computer keyboards were modeled after, and are still very similar to, classic typewriter keyboards. Many different keyboard layouts are available around the world (like Dvorak and JCUKEN) but most keyboards are of the QWERTY type. 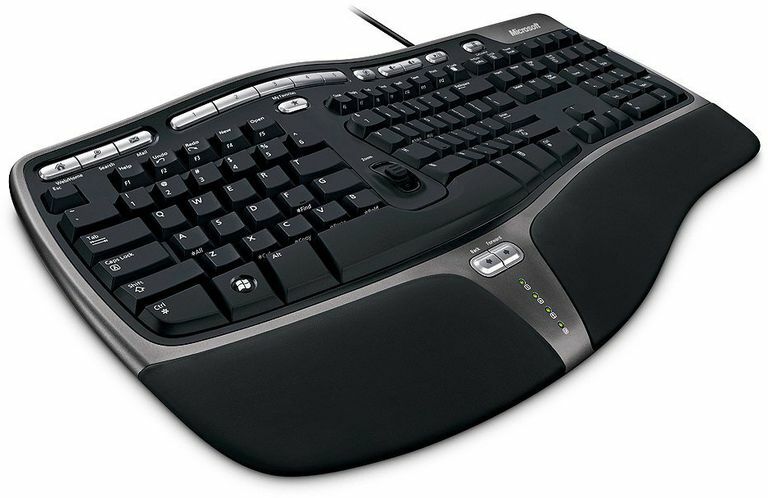 Most keyboards have numbers, letters, symbols, arrow keys, etc., but some also have a numeric keypad, additional functions like volume control, buttons to power down or sleep the device or even a built-in trackball mouse that's intended to provide an easy way to use both the keyboard and the mouse without having to lift your hand off the keyboard. Many keyboards are wireless, communicating with the computer via Bluetooth or an RF receiver. Wired keyboards connect to the motherboard via a USB cable, using the USB Type A connector. Older keyboards connect via a PS/2 connection. Keyboards on laptops are of course integrated, but technically would be considered "wired" since that's how they are connected to the computer. Both wireless and wired keyboards require a specific device driver in order to be used with the computer. Drivers for standard, non-advanced keyboards usually don't need to be downloaded because they're already included in the operating system. Tablets, phones, and other computers with touch interfaces often don't include physical keyboards. However, most do have USB receptacles or wireless technologies which allow external keyboards to be attached. Like tablets, most modern mobile phones utilize on-screen keyboards to maximize the screen size; the keyboard can be used when needed but then that same screen space can be used for other things like watching videos. If the phone does have a keyboard, it's sometimes a slide-out, hidden keyboard that rests behind the screen. This both maximizes available screen space as well as allows for a familiar physical keyboard. Laptops and netbooks have integrated keyboards but, like tablets, can have external keyboards attached via USB. Though most of us use a keyboard nearly every day, there are many keys you probably don't use, or at least aren't sure why you use them. Below are some examples of keyboard buttons that can be used together to form a new function. Some keys you should become familiar with are called modifier keys. You'll probably see some of these in the troubleshooting guides here on my site; the Control, Shift, and Alt keys are modifier keys. Mac keyboards use the Option and Command keys as modifier keys. Unlike a normal key like a letter or a number, modifier keys modify the function of another key. The regular function of the 7 key, for example, is to input the number 7, but if you hold down the Shift and 7 keys simultaneously, the ampersand (&) sign is produced. Some of the effects of a modifier key can be seen on the keyboard as keys that have two actions, like the 7 key. Keys like this have two functions where the topmost action is activated with the Shift key. Ctrl-C is a keyboard shortcut you're probably familiar with. It's used for copying something to the clipboard so that you can use the Ctrl-V combination to paste it. Another example of a modifier key combination is Ctrl-Alt-Del. The function of these keys isn't as obvious because the instructions for using it aren't laid out on the keyboard like the 7 key is. This is a common example of how using modifier keys can produce an effect that none of the keys can perform on their own, independent of the others. Alt-F4 is another keyboard shortcut. This one instantly closes down the window you're currently using. Whether you're in an Internet browser or browsing through pictures on your computer, this combination will instantly close the one you're focused on. Although the common use for the Windows key (a.k.a start key, flag key, logo key) is to open the Start menu, it can be used for many different things. The Win-D is one example of using this key to quickly show/hide the desktop. Win-E is another useful one that quickly opens Windows Explorer. Microsoft has a large list of keyboard shortcuts for Windows for some other examples. Win+X is probably my favorite. Some keyboards have unique keys that don't work in the same way as a traditional keyboard. For example, the TeckNet Gryphon Pro gaming keyboard includes 10 keys that can record macros. In Windows, you can change some of your keyboard's settings, like repeat delay, repeat rate, and blink rate, from the Control Panel. You can make advanced changes to a keyboard using third-party software like SharpKeys. This is a free program that edits the Windows Registry to remap one key to another or disable one or more keys altogether. SharpKeys is extremely useful if you're missing a keyboard key. For example, if you're without the Enter key, you can remap the Caps Lock key (or the F1 key, etc.) to the Enter function, essentially removing the former key's capabilities so as to regain use of the latter. It can also be used to map keys to web controls like Refresh, Back, etc. The Microsoft Keyboard Layout Creator is another free tool that lets you quickly change the layout of your keyboard. Little Tiny Fish has a good explanation for how to use the program. Check out these pics for the top ergonomic keyboards.